Flailing in jobs, failing at love, getting addicted and un-addicted to people, food, and drugs—I'll Tell You in Person is a frank account of attempts at adulthood and all the less than perfect ways we get there. 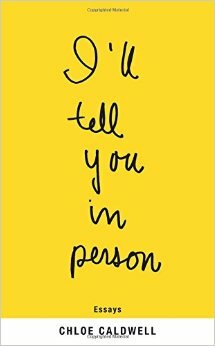 ...[an] exceptional personal essay collection ... after reading the 12 essays in this fantastic collection, I feel as though I know Chloe Caldwell, a statement which is a testament to the power and satisfaction to be found in her utterly funny, confiding, and self-aware skill as a writer. In this slim collection Caldwell speaks squarely on her own behalf with great clarity and humor. She regales the reader with her experiences as a child of divorce, as a Manhattan shop girl, a heroin addict, a failed singer, a babysitter, a yogi. Caldwell isn’t trying to shock the reader. Rather, these stories are a means of locating herself in an ever-shifting world. She successfully maneuvers the tough practice of empathy. The strongest scenes reflect Caldwell's preoccupation with the relationships we tend to discard ... Despite Caldwell's brush with addiction, these essays don't sit within the train-wreck subgenre. When a babysitting charge asks if she's had a sad life, she says no. But this isn't the work of an extremely well-known and wildly successful person either, as is so often true with tell-all collections by funny females. Caldwell is refreshingly regular ... Caldwell adopts a non-performative, take-it-or-leave-it tone, as though she's an old friend you're catching up with over glasses of wine. What did you think of I'll Tell You in Person?